All transactions are safe and secure with a reliable history in online purchasing behind each of our associates. Buy the Optimus Prime Costume t-shirt to own Transformers clothing and merchandise. These Transformers costume Optimus Prime t-shirts feature a faded image of the leader of the Autobots Optimus Prime, with the Transformers cartoon logo on the sleeve. 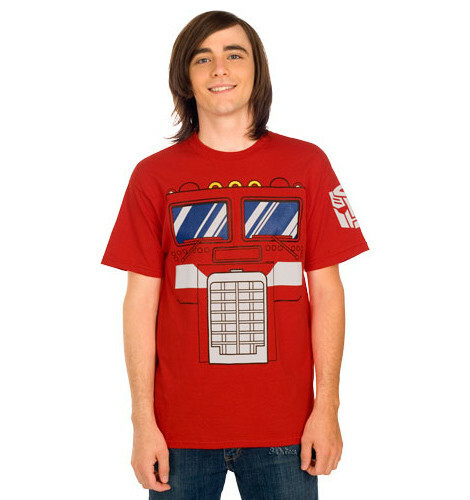 This Autobot costume tee lets you embody the leader, who transforms into a cab-over truck. This Transformers t-shirt is a stylish tribute to the television cartoon that aired from 1984 until 1987. Wear it out when you're cruising around in your vintage yellow Beetle (a.k.a. Bumblebee). Show support for Optimus, your Autobot leader. In addition to the Optimus Prime Costume tee above, browse the Transformers Clothing Gallery for more apparel like men's and women's clothes, kids shirts or hoodies.